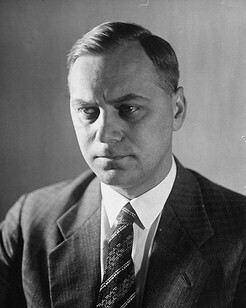 Pportrait of influential Nazi racial 'philosopher' Alfred Rosenberg, an early member of the Nazi Party and propagandist. His writings included the 1930 book "The Myth of the Twentieth Century" which declared the existence of two opposing races: the Aryan race, creator of all values and culture, and the Jewish race, the agent of cultural corruption - a viewpoint taken literally by Hitler and the Nazis. 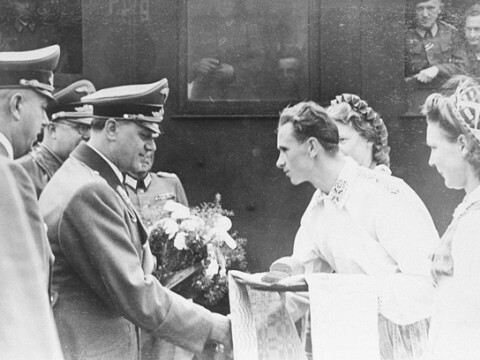 Below: Following his appointment as Reich Minister for the Eastern Occupied Territories, a staged scene in which Rosenberg receives a tribute of bread and flowers from a young Ukrainian couple.